In the year 2000, the Food and Drug Administration (FDA) approved the da Vinci Surgical system, the first robotic surgical aid. Since its introduction, surgeons have used da Vinci to complete more than 20,000 procedures. Simultaneously, medical researchers have developed many innovative robotic technologies. As the public grows more familiar with these advanced systems, health care robotics are becoming a strong marketing point for health care institutions. Robotic technology is becoming so advanced that engineers have developed ways to give robots a sense of touch using artificial skin. This capability is a major development in the field. The technology has the potential to drastically improve the quality-of-life for patients with severe disabilities. In recent years, the use of robots for health care applications is rising. As new discoveries emerge, the promulgation of robots in the medical field is growing rapidly. Medical robots typically fall under two general categories; devices that assume repetitive and manual tasks and telemedicine robots - the latter which helps patients who are restricted to their homes access services. Most often, large institutions and academic medical centers make use of these technologies. Still, in some patients’ homes, robotic assistants aid seniors and other patients with activities of daily living (ADL) and help others learn to walk again. There are larger machines used to lift patients and smaller machines that keep homebound seniors company. Elsewhere, the Department of Veterans Affairs (VA) is using an intelligent management system that sorts, sterilizes and tracks surgical instruments, and in some hospitals, mobile robots deliver pharmaceuticals, supplies and test results. The units, which resemble oversize filing cabinets, fulfill the same role as human hospital runners. While there are many amazing innovations emerging, health care organizations are still investigating whether the devices improve operations and streamline costs. In the meantime, nurses and other health care professionals are adjusting to a new health care environment. It's likely that these technologies will benefit health care professionals who work on the front lines of service. The devices allow professionals, such as nurses, to spend more time with patients and complete administrative tasks more efficiently. Machines can never replace the ability of nurses to express empathy and share compassion. Still, many nurses may wonder how robotic assistants will affect their careers. One day, nurses and robot working side-by-side in the health care setting may become a common phenomenon. 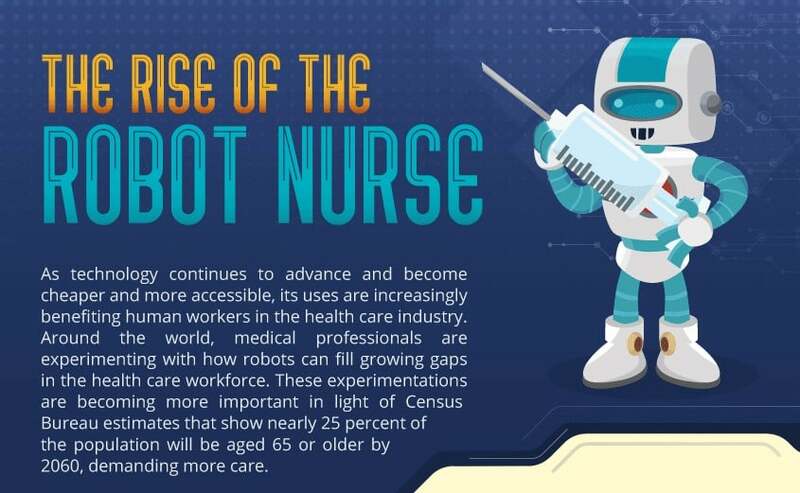 You can learn more about the exciting advancements in health care robotics by clicking here to view a revealing infographic created by Ohio University’s Online Master of Science in Nursing program.